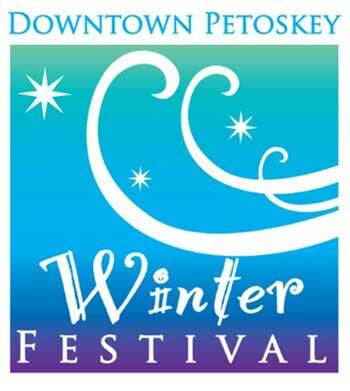 Celebrate the winter at Petoskey's Winter Carnival on downtown Petoskey. This year, Downtown Petoskey is excited to announce its' partnership with the long-running Winter Sports Park Winter Carnival! . Wine and Progressive Dinner, 6pm Starter, Petoskey Farms Vineyard & Winery Downtown Tasting Room. Cheese Course, Petoskey Cheese. Soup and Salad, City Park Grill. Entree, Stafford's Perry Hotel. Pasta Giardiniera with eggplant, portobello mushrooms, roma tomato, capers,castelvetrano olives, roasted garlic, Italian parsley, mint, ricotta cheese and pine nuts. Garnished with a Parmesan cheese tuile and served with house baked Italian bread, roasted bell pepper & tomato-basil compound butter. Dessert, Palette Bistro. Tickets are $50 per person. Space is limited. 231-348-0388. Chocoholic Frolic, 3-7pm. Tour the downtown stores, and be treated to chocolate treats wherever you go! If you visit all of the participating stores, you can enter into the drawing for the Chocoholic Gift Basket. To participate, simply pick up a Stamp Book at the Downtown Office or at any participating store and start your chocolate tour! Little Traverse Bay Humane Society, Rock Out for Rescue, 6-19pm A dueling piano party at The Perry Hotel in Petoskey! There will be hors d'oeuvres, a cash bar, a silent auction, dancing and a whole lot of FUN! Tickets are only $50. Valentines Concert at Red Sky Stage, 7pm Two very talented Northern Michigan musicians unite to present this delightful evening of music to celebrate Valentines Day; Kelly Shively and Dan House. Ghost Walk, 8pm You'll be shivering for more than the winter temperatures by the time you finish this hour long tour of the haunted buildings in Downtown! Start the spooky tour inside at the Perry Hotel, and finish with a walking tour throughout Downtown. Tickets are $15 per person. Space is limited. 231-348-0388. Ice Bar Celebration, 1-4pm. sponsored by High Five Spirits with proceeds supporting Tip of the Mitt Watershed Council, Pennsylvania Park. Music from Lite 96.3 with DJ Tim Nixon. Fowling, Ladder Ball and Bags. Kid's Activities, Pennsylvania Park, 1-4pm Snowshoeing with Bearcub Outfitters, snowman building contest, make a cardboard sled for the Cardboard Sled Challenge at the Winter Sports Park, warm up with hot cocoa and inside activities at the Petoskey District Library. Live Ice Carving, 2pm Pennsylvania Park. 11:30am, 5 Star/Kobe Winter Charity Classic Hockey Tournament 4 adult teams/4 games running throughout the day. 12pm, Bumpjumping Competition Begins Come check out or compete in an event unique to Northwest Michigan. Scavenger Hunt, 11am-4pm Downtown shops.